In September 2013, the fourth edition of DocksArtFair™ will take place, bringing together 40 international galleries for a contemporary art fair that is based around a set of unique principles. Unique, because it gives the public a chance to discover and learn about the current creative work of the selected galleries, through the presentation of a solo presentation by an artist at every booth. Unique, because DocksArtFair™ is attached to the Biennial of Contemporary Art of Lyon, by date as well as geographical situation in the Confluence, a newly developed district in Lyon, and a symbol for the 21st century. Finally, unique because the region (Rhône-Alpes and the surrounding areas) is rich in structures dedicated to contemporary art (museums, art institutions and art schools), a fact that has allowed DocksArtFair™ to take up a leading role in the international contemporary artistic scene. 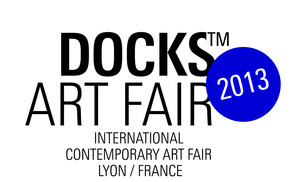 DocksArtFair™ enters a synergy with all these other organizations and offers to Lyon and its region the opportunity to become a dynamic place in the contemporary art market, and taking its place in the schedule of international contemporary art fairs.